Something that has not been completed is not always bad. How about something that has not been completed can be better even beautifies your home? Yes, from many home designs, one of those is a home design with unfinished style. Homes with unfinished interior design style like this are deliberately made as if there are some elements that have not been completed. 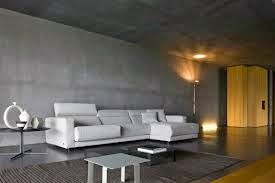 One of the elements of the home that may be designed in the unfinished style is the wall of living room which left only whitewashed cement. This design can eliminate the formal impression and give the relaxed impression since living room is supposed to be designed as relaxed as possible; it may give you a place to eliminate the fatigue and chat with all members of your family. However, to avoid this kind of room looks monotonous; you may put freshener elements such as green plants and mix colors on the interior of the unfinished living room. In addition, to keep away from dark and cluttered appearance, then the unfinished style living room can be made to widen and put stuff inside as little as possible. Another thing that you can get from this home design style is the room will feel cooler.